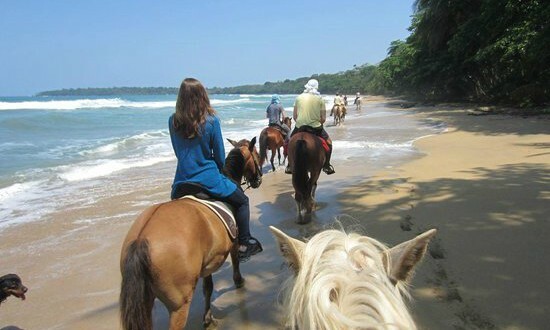 The Caribe Horse Riding Club is located 6 miles South of Puerto Viejo. The ranch is surrounded by jungle and opens on one of the most beautiful beaches in the area. 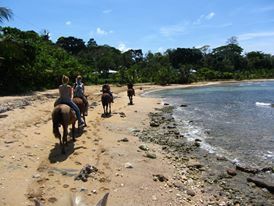 Every day jungle and beach rides can be organized and it is even possible to take a swim in the ocean with the horses! Sixteen horses are kept at the ranch where ´natural horsemanship´ is practiced. Tasks: You will be assisting with daily care of the horses and barn area (tack cleaning and horse care). Depending on the length of your stay and your previous experience with horses, you can be given more responsibility and you will be able to learn more about caring for horses. Other requirements: Wear working boots (can be provided at the ranch) and comfortable clothes that may get dirty. You need to pay a fee. There are two packages, one for beginners and one for people with horse experience. Min time of dedication: Min 2 days per week, during 2 weeks. Work schedule: 8:30 untill noon, Monday till Friday. Internships available: Yes, directly with them.